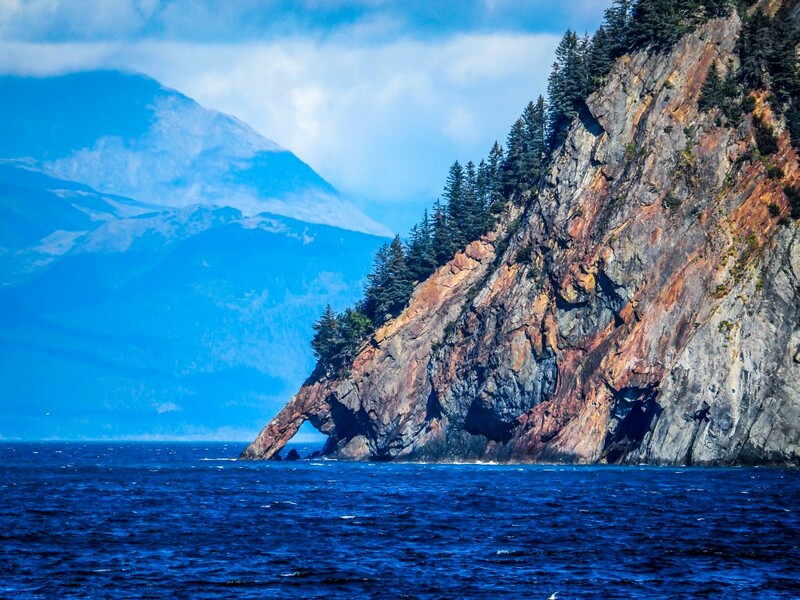 If you visit Seward an absolute must is to take a day trip into the Kenai Fjords National Park. You will be amazed by a beautiful, lush green coastline featuring tidewater glaciers. 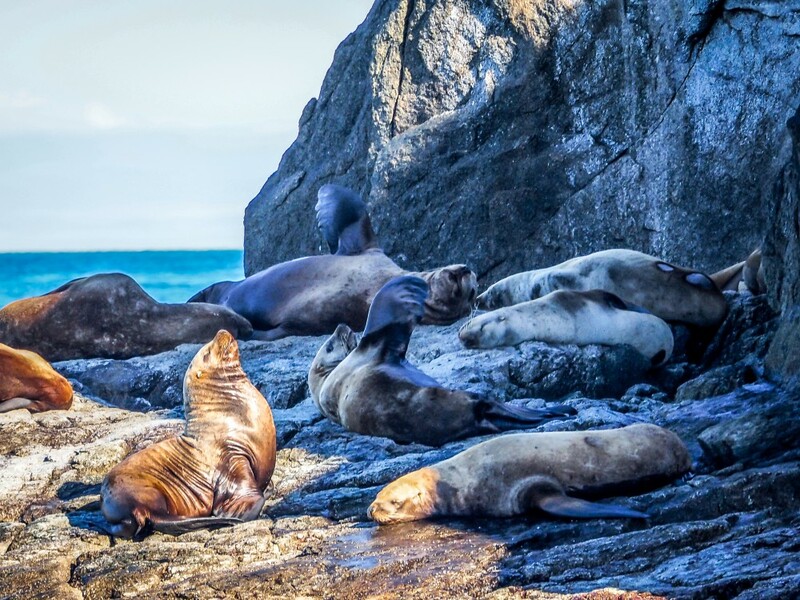 More than likely you will also meet some of the locals, like killer whales, humpbacks, puffins, sea otters and other marine life. There are numerous companies offering tours to the National Park that is named for this numerous fjords carved by glaciers. There glaciers origin from Harding Icefield which is one of the largest icefields in the United States. A boat trip is the only way to see its many glaciers, except Exit Glacier which can be reached by car. 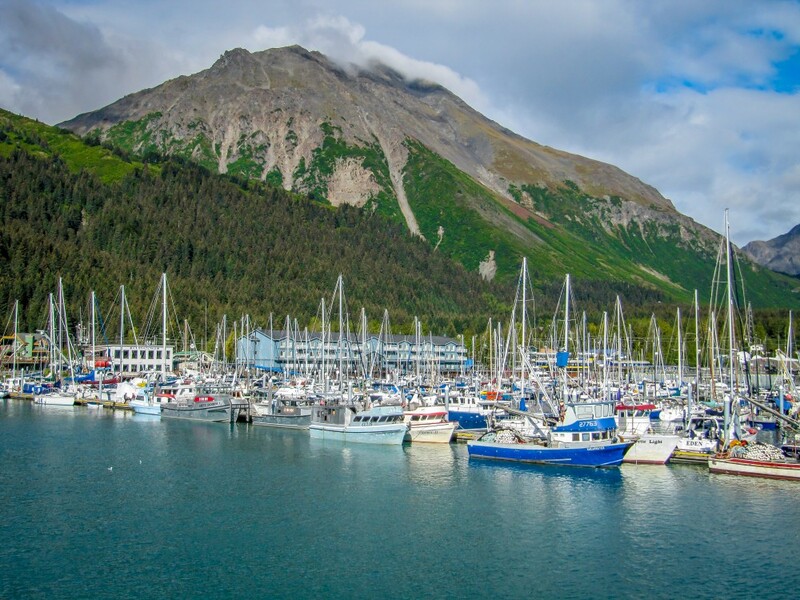 The tours all start from the picturesque harbour of Seward. Surrounded by mountains and filled with colourful fishing boats the harbour is a beautiful spot in itself. This is also the perfect spot to see fishermen clean the catch of the day. As soon as we got on the water it didn’t not take long before we spotted our first glacier. The park protects the icefield, a narrow fringe of land between the mountains and the sea, and the rugged coastline. All of which we got to experience on this trip. I was crossing my fingers for orcas (or often referred to as killer whales) and humpbacks was thrilled when we got to see both! The humpback didn’t stay with us long, but did offer a lovely pose of it tails before it dowe under. The orcas however seemed like they were hunting along the shoreline and we followed them for 20-30 minutes. It must have been around 8-10 orcas in the pod that we observed. I was surprised by how close to the shore they went. I could have stayed with the orcas all day had it been up to me. But we were headed to see a tidewater glacier and had to move on. 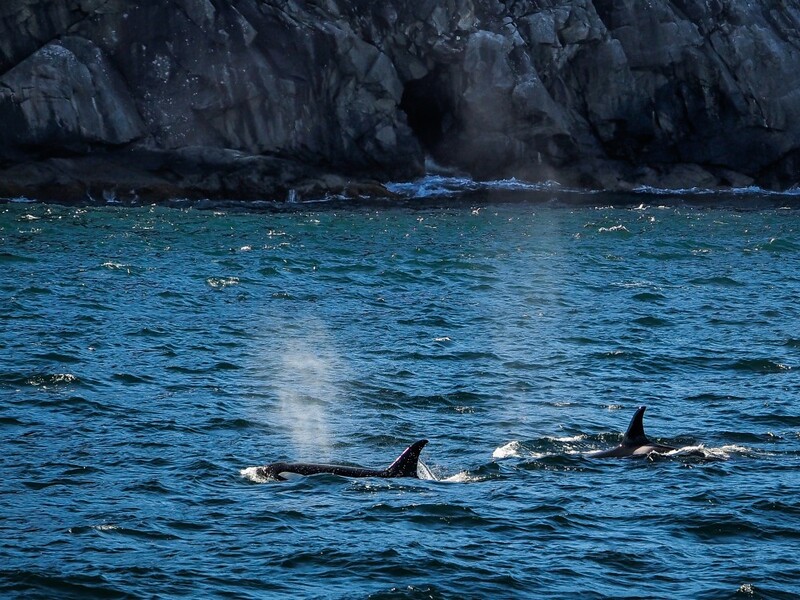 One last picture of the orcas before we continued further into Kenai Fjords National Park. For those of you interested in geology, or the Ice Age animation movies, you’ll be excited to learn that this park has been landscaped by Continental Drift. Beyond the surface of this beauty large forces are at work as the continental plates collide. Did you know that some of the rock you see was once coral reef close to the equator. Pretty fascination to think about, right? About half of the park is covered by ice and we were heading in Aialik Bay to see some of it up close and personal. 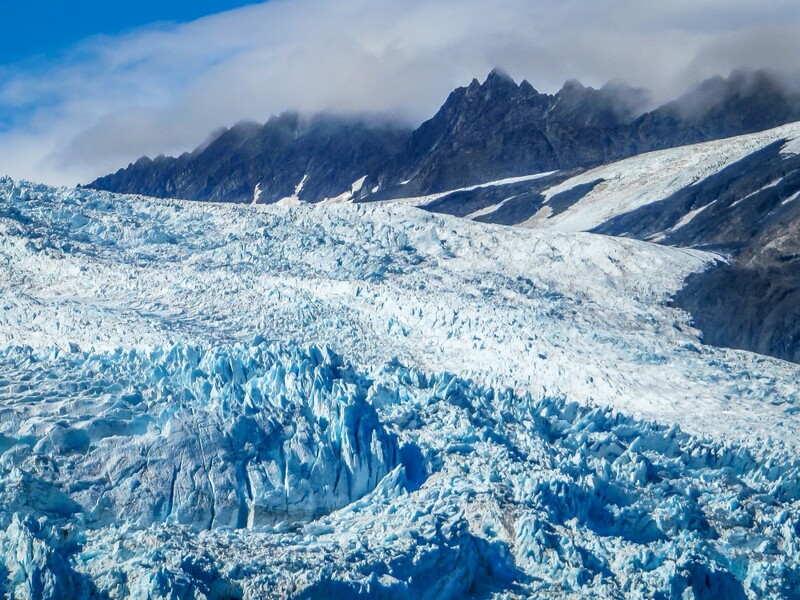 Aialik Glacier is one out of 38 glaciers in Kenai Fjords National Park with Harding Icefield being the source of all of them. It is such an impressive feeling to be close to a tidewater glacier. You can feel the draft get colder the closer you get. When you get up close you realise the size of the wall and you hear the cracking and thundering when the glacier calves. And those deep blue colours are nothing less than stunning. Aialik Glacier was our turning point, but the fun was far from over. 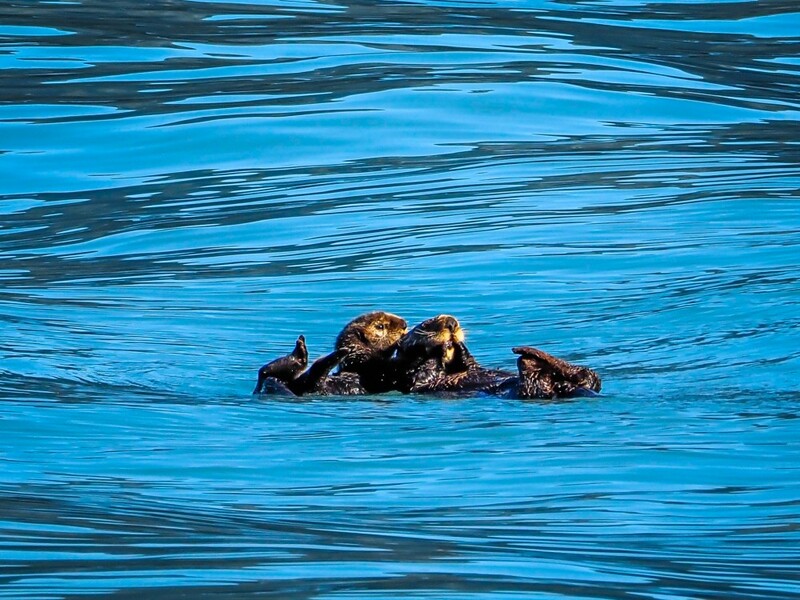 On our way out Aialik Bay we came across the most adorable sea otters. If you have ready any of my previous Alaska posts you know I have a soft spot for these fellas. Just look at them clinging together in the water having a snack. So cute. A bit further out on one of the more exposed rocks a group of seller sea lions kept it cool in the shadow. We saw a lot of sea lions while in Alaska, but this bunch I must admit was of the more relaxed type. It must have been far outside of breeding season. A day cruise is the way to go if you really want to experience Kenai Fjords National Park. The tours usually run from May to September. 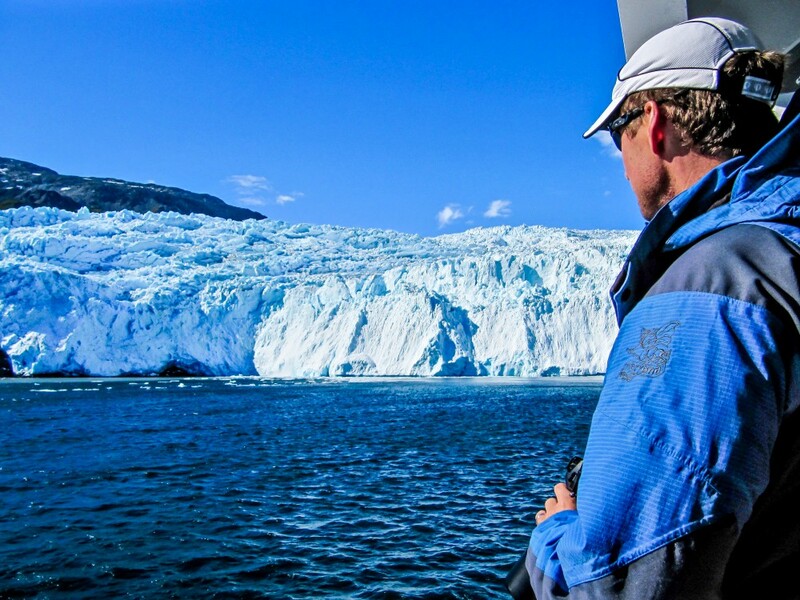 You should at least do a 6 hours tour to have sufficient time to visit one of the tidewater glaciers. For those enthusiasts out there you will also find longer options. Should you be more adventurous you take a kayaking tour that includes overnight in a wilderness cabin in the park. Thanks for reading, we would love to hear what you think. 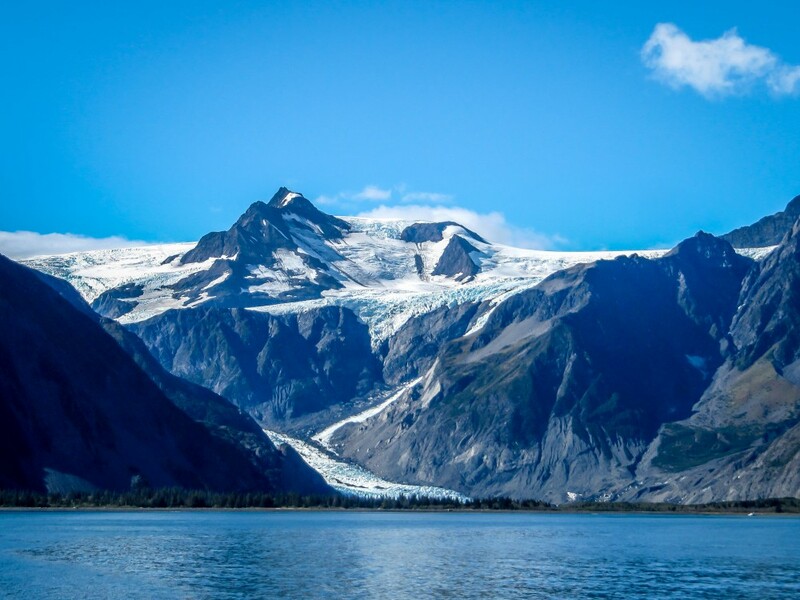 Have you been to Kenai Fjords National Park? What would be your favourite moment, the orcas or the tidewater glacier? I just took a trip along the coast of Washington and Oregon and didn’t get to see a single orca. 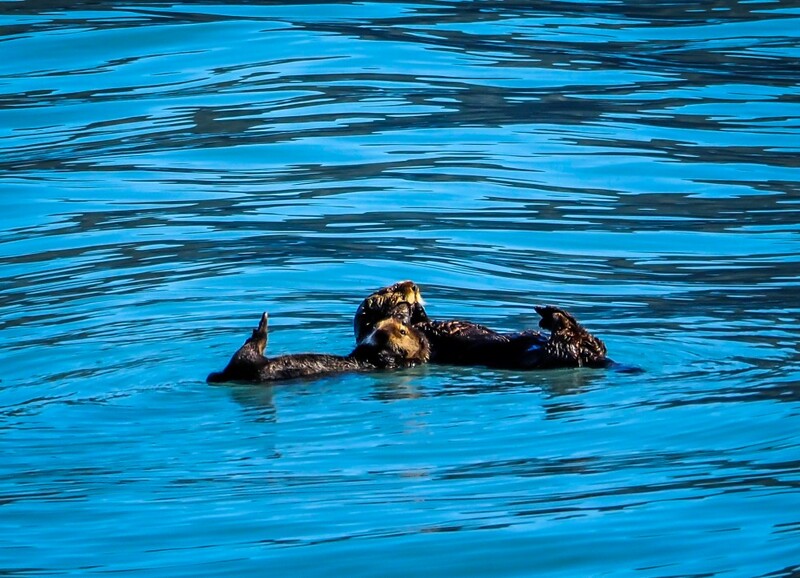 I did see one sea otter, but it was underwater and swimming away. I could see it come up. I was disappointed to spend so much time on the coast and see neither. You got them both in one boat ride! I have been on some of those boat trips as well but they don’t make that good blog posts. I always enjoying being out at sea, but it is definitely more fun when you see some wildlife. And orcas and sea otters are the best! Thanks for stopping by Emilie! I agree the sounds of caving glaciers is pretty amazing! Lucky you were to see so many puffins. We were a bit late in the season for puffins so we only saw a couple of them from a far distance. Puffins is really something I would like to experience close-up. They are very beautiful. Luckily we actually have puffins where I am from back home in Norway, so sooner or later it will probably happen. The orcas and sea otters are my favourites for sure. Any orca day is a good day! Thanks for stopping by. My trip to Alaska a few years back didn’t take us to Kenai at that time. That will be for the next trip to this fabulous and exciting place. Your pics are simply wonderful and the colors splendid. Congrats. Thank you so much for your generous comment Alix! Kenai was lovely – it is definitely worth a visit! Which places did you visit while in Alaska. Maybe you have some ideas for our next Alaska trip? 🙂 Check out my coming posts for ideas as it will be all about Kenai for a little while now:) Thanks for stopping by! Thanks a bunch Ingrid, appreciate you visit! We were so lucky with the weather! Sunny and not too windy. Some waves on the open areas but mostly calm enough to avoid any sea sickness:) To be honest, majority of our Alaska trip we had awesome weather despite it being September. Lucky us! Thanks for stopping by. Excellent! How can I choose? Glaciers? Whales? A colorful harbor, and your writing…. all good! No need to choose – when you go to Kenai Fjords NP you can have a little bit of everything:) Thanks for your awesome comment! Now that is a wonderful trip. I too have a soft spot for sea otters. Thanks for the post. I once had a trip scheduled and paid for to visit that very place. My husband injured himself and broke both ankles and we had to cancel the trip. We never made it but I hope to get there one day! Thanks for bringing me there temporarily. That’s too bad. And both ankles – how in the world did that happen!? Next time:) Thanks a bunch for stopping by! What do you do when you have broken both ankles? Wheelchair for weeks on end? Does not sounds good at all! Glad he was able to fully recover. Absolutely gorgeous. Would love to see Alaska one day both for the wildlife & the geology. Great photos. Thank you! I would agree with you – Alaska has both interesting geology and wildlife – but I do have to say the wildlife would be my personal fav:) Thanks for stopping by. Thank you so much Jim! What wildlife did you encounter on you trip? I believe there is normally a lot of puffins in the area earlier in the summer. Too late on the season for them when were were up there. But the orcas and sea otters made up for that! Thanks for stopping by. Such astounding photos. It must have been a remarkable adventure! Thank you Sue! It was a lovely day on the sea. Awesome to see all the wildlife! If is definitely the best way to see this national park:) Thanks for stopping by! It looks so great. Ocean, Glacier, wild Animals, could one want more!? Thank you! I fully agree – what more could one want? 🙂 Thanks for stopping by! Yours is a great valuable blog ! Thanks you so much for you generous comment! Much appreciated. With such a lovely scenery it is fun taking photos! Thank you so much Indah! I loved all the wildlife on this trip – my fav part. Guess you’ll soon be closer enough for a visit yourself! If you go earlier in the season I am sure you can add puffins to the wildlife list. Thanks for stopping by. Thanks Jane! It is a lovely location – had we only had more time to explore it! You can go on overnight kayaking trips here…that will have to wait for next time. The wildlife was my favourite part, but I guess that is not a surprise:) Thanks for stopping by! The scenery is amazing. So is the wildlife. I would love the place. Yes is it not? The ocean and the glacier-studded mountains are awesome. And who doesn’t love seeing orcas and otters. It was a lovely way to experience Kenai Fjords National Park. Thanks for stopping by. Such a treat to see that wildlife, up close! Beautiful photos, as always, Inger. Your posts are always educational, fun and picturesque. Thanks a bunch for your sweet comment! Seeing wildlife this close is such a rewarding experience. And in Alaska you can have this experience everyday. What a location! (I would like a travel agency…haha) Thanks for stopping by! 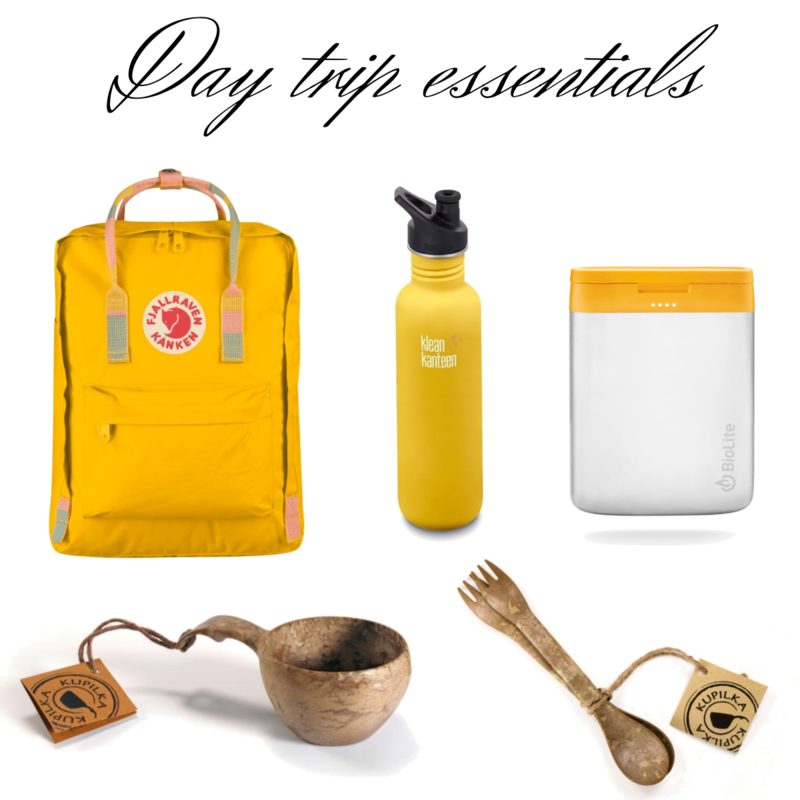 Do you read the blog Planet Bell? a cool guy who lives there and travels four months during winter, off season. Funny guy, an expert on poop in India. I am with you – I could have watched the whales all day (but then I would have missed the otters!!!). Have your cake and eat it too! 🙂 Alaska has to all! Thanks for stopping by Sarah. I like the way the colorful rocks slope down to the sea. Thanks Steve! I agree – also love the different red colours in the rocks. Lovely scenery in Kenai Fjord NP so plenty of photo opportinities. Thanks for stopping by! 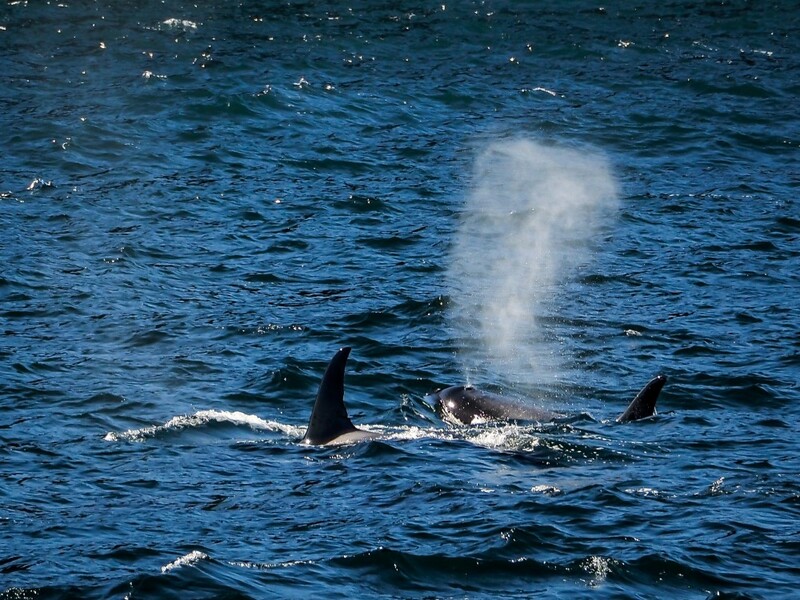 Great story and gorgeous photo’s.Such a fantastic view swimming orca. Every time I come here to read your posts, I am rewarded with both the experience of seeing something beautiful and it restores my faith in nature 🙂 Great description of this place ~ your photos show an experience that many people not only will never experience but perhaps never even know are possible. They are such magnificent animals right? I have been lucky to experience them 3 times now, feeling grateful every time! This is a part of the world I would really like to visit. 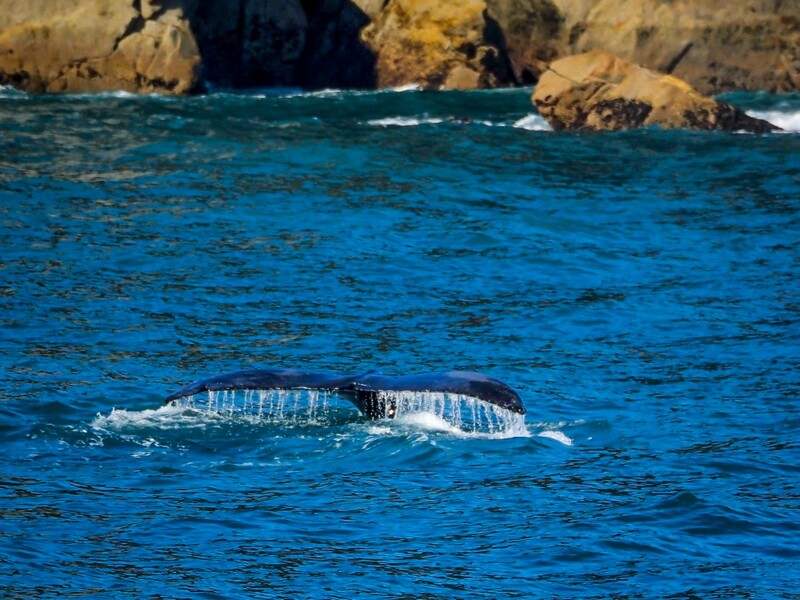 You were so lucky to see all those whales and the scenes of the shores from the water are amazing! Thank you so much! I loved this coast line! Filled with wildlife, glacier-studded mountains, red rocks diving into the ocean – what more can one ask for? So much to see there! 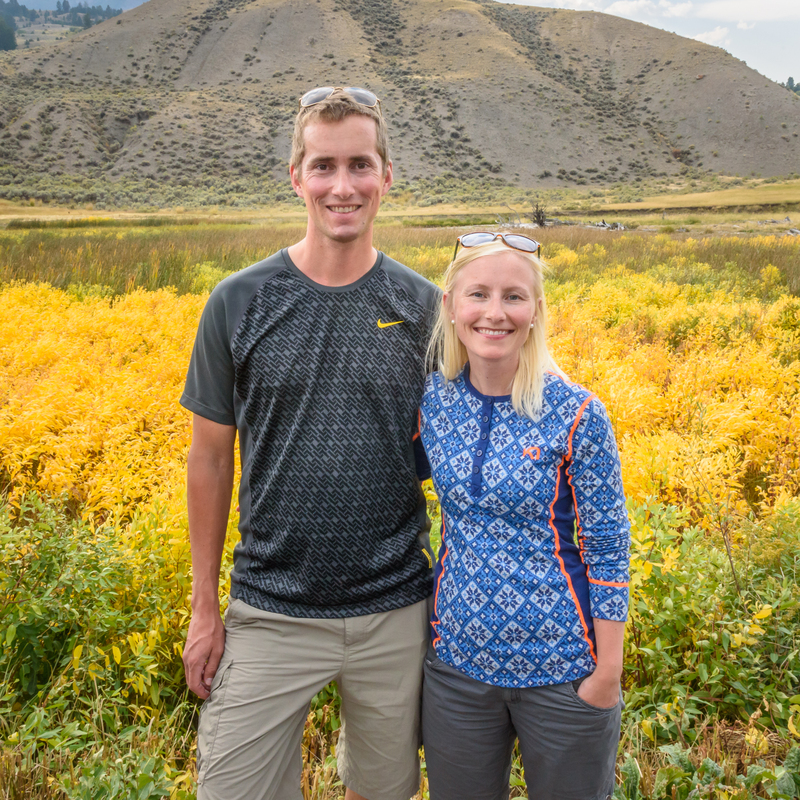 Absolutely breathtaking scenery and tons of wildlife – absolutely wonderful! Yes – what a scenery! There was something new around each bay. I could definitely go back. I am sure there is tons more we didn’t have time to see. And if you go earlier in the season there are puffins as well:) Thank you for stopping by Sheryl! Thanks a bunch! 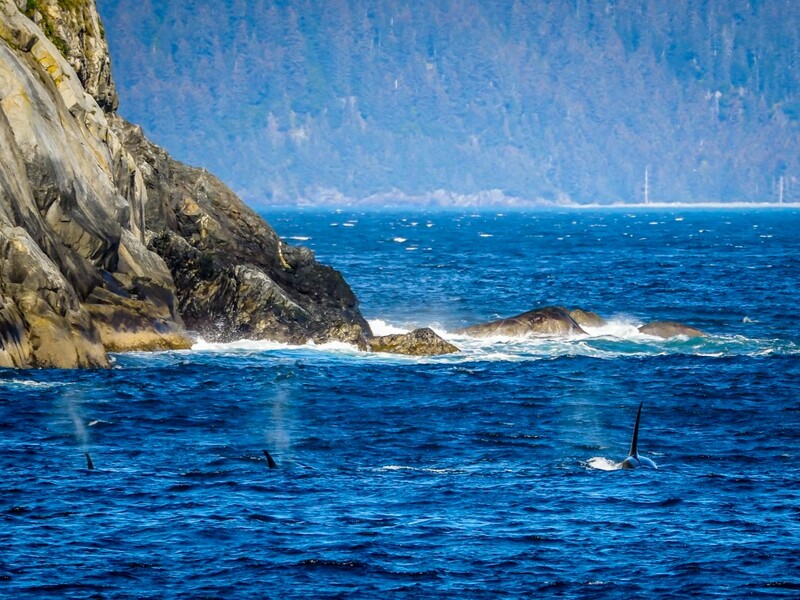 I always love seeing orcas – they are so fascinating! Thanks for commenting, much appreciated! Beautiful shots! It is my dream to make it to Alaska one day. This was one of our favorite tour while we were in Alaska in 2012.